Some additional armpit sweat doesn't appear like a major ordeal. Everyone sweats right? However, when excessive sweating influences your confidence and day to day life (which could smother your upward mobility in the working environment) it's a great opportunity to make a move. Here's the manner by which to avert underarm sweating. Anticipating excessive underarm sweating is in itself humiliating. Feeling free from the dread of sweating helps give you confidence in introductions, on dates and in regular interaction. There are a few different ways other than antiperspirant to counteract underarm sweating i.e. applying antiperspirant before bed time, wearing a sweatproof undershirt to absorb and evaporate sweat, physician endorsed medicines, overseeing stress and keeping away from specific foods that trigger your sweat glands can help. 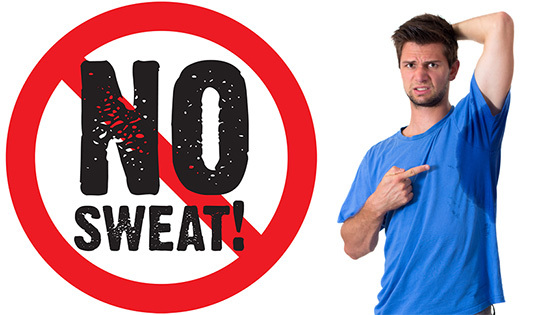 Excessive sweating doesn't need to control your choices. A great many people stress out over their problems with sweating. The best time to apply antiperspirant is really around bed time as your sweat glands will take in the active ingredient forming a plug and there by eliminating the problematic sweating. For best outcomes, apply to dry underarms just before bed so that by the morning you will have dry underarms. Out antiperspirant is waterproof thru showering and will last up to a week. It is also FDA approved. Stress is a noteworthy cause of underarm sweat. Agonizing over sweating adds to your daily stress level which can cause more stress. Finding ways to lessen your anxiety will enhance your psychological wellness which does also support your confidence. Stress-boosting strategies like recognizing triggers for stress, making daily schedules can clear your brain and diminish the tension related to sweating. The most ideal approach to avoid underarm sweat is to stop it at the source. Kleinert's underarm sweat shields totally retain sweat and enable it to escape as vapor, so sweat doesn't reach your outer clothing. Since the layering enables sweat to be absorbed and then evaporate, you're not left being wet all day. The objective of protective garments for people who have excessive sweating is to provide the most absorbent materials possible plus provide for the body remaining as dry as possible. Kleinert's has achieved this with it's patented 4 way construction. We distinctly use highly absorbent bamboo as our absorbent internal material. Bamboo is known to have 4 times the amount of absorbency as cotton. We prevent any remaining fluids from exiting into your outer clothing by means of a unique urethane waterproof layer which guarantees that sweat will not pass thru. Wicking fabrics are polyesters which when saturated will transfer the fluid to the outer garment or if there is no outer garment to the ambient air assuming its temperature is lower than the wearers body temperature. During that transfer process the wearer will remain wet. What you put in your body influences the amount you sweat. Stimulants like caffeine and liquor discharge chemicals that raise your heart rate, body temperature and pulse, making you sweat. Eating hot or fiery sustenance's and encountering stress can likewise start up your sweat glands, so in case you're stressed over sweating in unpleasant circumstances, it's best to stay away from these mystery sweat triggers. On the off chance that your underarms sweat unreasonably abruptly, you may have a medical condition known as axillary hyperhidrosis. For a few people, anticholinergics have appeared to viably dry out sweat glands, however they were not intended for this purpose. It's critical to comprehend the reactions of hostile sweat medicines and contact a specialist before utilizing anticholinergics to treat hyperhidrosis.